Official notification of the new national Qemal Stafa stadium. Photo © Exit. Less than twenty-four hours after Exit published a report on the progress of construction works at the site of the Qemal Stafa stadium, construction company AlbStar has finally put up the legally mandated construction notification. According to the notification, the building permit was approved by decision 25949/10 of the National Territorial Council (KKT) on September 20, 2016. The last decisions published on the website of the KKT date back to the end of July, making it impossible to verify the contents of the building permit. The construction works have supposedly started on October 3, and will be finished on April 3, 2020. However, the destruction of the former Qemal Stafa stadium had already been completed by the end of June, and excavation and construction works have been going on throughout the summer – before the building permit was officially approved in September. As developer is mentioned Qendra Sportive Kuq e Zi sha, a private–public partnership between the Ministry of Culture and the Albanian Football Association (FShF). The administrator of the company is Eduard Prodani. According to its registration at the National Center for Registration (QKR), Qendra Sportive Kuq e Zi has as aim to “rebuild, modernize, and administrate the national Qemal Stafa stadium, [as well as] any other activities that assists in or fulfills” that aim. Qendra Sportive Kuq e Zi’s profit in 2014 was 11,596,015 lekë (~€85,000), whereas its losses in 2013 were a staggering 565,402,178 lekë (~€4.15 million). Although more recent numbers were unavailable, the 2013 losses make it doubtful whether the company is financially healthy enough to confront the actual operation of the new stadium. In February, Prodani had stated that “it is a condition [for the construction company] that the construction of the stadium is completed within a 24-month period, so [the company] that will win the tender and will sign the contract will have as condition to complete the stadium within 24 months from the beginning [of the construction works].” Not only has there been no tender, but, as is clear from the notification, the works will only be completed in 42 months. The construction company – selected without an open tender procedure – is AlbStar shpk. In 2014 and 2015, AlbStar received a total of 1,566,716,686 lekë (~ €11.5 million) for several government construction projects. It is unknown how much AlbStar receives for the construction of the stadium. The supervision of the construction work is done by Sfera Studios, the architecture studio of Artan Shkreli, who is at the same time Councillor for Territory of Prime Minister Edi Rama and former member of the Council for the Regulation of the Territory of the Municipality of Tirana under Rama. Considering the fact that Qendra Sportive Kuq e Zi is a public–private partnership, the involvement of Shkreli’s private firm is a clear conflict of interest. Finally, the architectural firm that is officially listed as designer is Atelier 4, with Marco Casamonti’s Archea Associati as architectural consultant. Considering that Casamonti has to serve jail time for corruption in Italy, it seems natural that his role in this project is more constrained than initially proclaimed by the Prime Minister. Atelier 4 is Prime Minister Rama’s favorite architecture studio, and has been involved in his urban politics since his first term as mayor of Tirana. It has been involved in most large infrastructural projects executed in Tirana, including the urban requalification of Skënderbeg Square and the Pazar i Ri, the reconstruction of the Theater of Opera and Ballet, and the children’s playground in Tirana’s Lake Park. As such it is the default “local partner” of international architecture firms such as Bolles + Wilson and 51N4E. 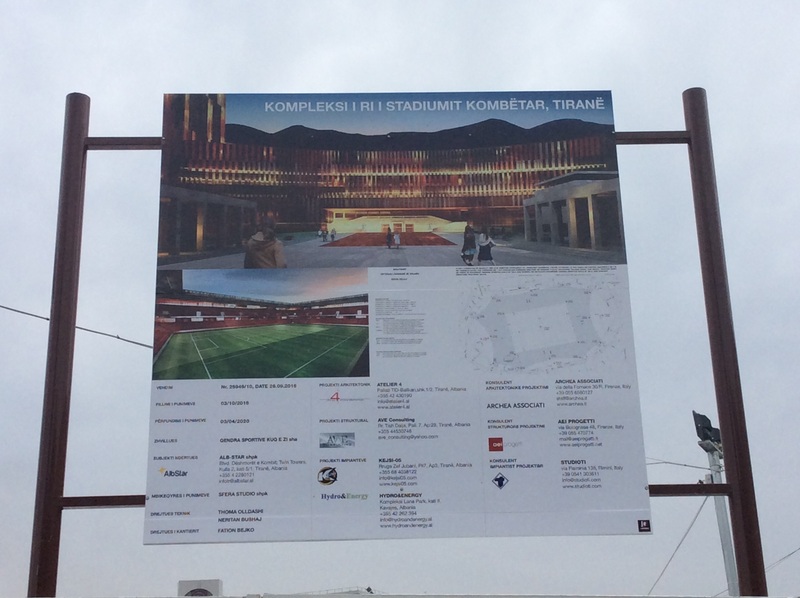 All in all, the new project for the Qemal Stafa stadium provides a “who is who” of all close collaborators of Rama’s government, which is surprising considering the fact that the new stadium is officially not a government project; it has followed none of the legal procedures that a government project of this size would normally be subjected to. Unless, of course, the whole private–public partnership construction with Qendra Sportive Kuq e Zi is just a way to hand out presents to friends without any oversight, legal, parliamentary, or otherwise. Update: In a previous version of this article, a different aim of Qendra Sportive Kuq e Zi sha was mentioned, due to erroneous data in its registration at Open Corporates Albania.